KUALA LUMPUR (Nov 6): The FBM KLCI fell 7.31 points or 0.4%, dragged down mainly by blue chips like Tenaga Nasional Bhd and British American Tobacco (M) Bhd (BAT). At the 5pm closing bell, the KLCI settled at 1,831.98 points, its fourth consecutive fall since Monday. BAT had raised prices of all its cigarette brands, effective yesterday, following an excise duty hike on tobacco products last Saturday. Across Bursa Malaysia, 2.8 billion shares worth RM2.5 billion were traded. 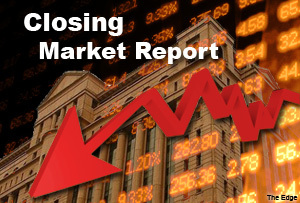 Market decliners defeated gainers by 436 versus 364 while 328 counters were unchanged. The top gainers included Chin Teck Plantations Bhd and Kuala Lumpur Kepong Bhd while the top decliner was BAT. Shares of beleaguered national carrier Malaysian Airline System Bhd (MAS) was the most actively-traded. MAS’ shareholders today gave the nod for Khazanah Nasional Bhd to privatise MAS at 27 sen each. MAS shares were traded heavily with 781 million shares done. The stock closed 0.5 sen or 2% higher at 26.5 sen. In Asia, Japan's Nikkei 225 closed 0.86% lower, South Korea’s Kospi rose 0.26% while Hong Kong’s Hang Seng closed 0.20% lower. Asian shares and commodity currencies stumbled on Thursday as prices for a host of commodities retreated on lingering concerns over slower global growth, while Tokyo stocks stepped back after posting large gains in a Bank of Japan-inspired rally, according to Reuters.